Get 20% Off One Full Price Item When You Sign Up For Email. Offer valid for new customers. Limit one use per customer. Save up to 50% on Men’s Jackets & Coats from The North Face, Patagonia, Columbia and more + Free 2-day shipping on orders over $50. Get up to 55% Off Select Scarpa. Save up to 50% on select Burton, Black Diamond, Volcom, and more. Smartwool on sale! Get 25% Off select smartwool socks & baselayers. Shop Patagonia Apparel & Gear For The Whole Family With Savings Up To 80% Off select merchandise. Place Your Order Today! Get up to 50% off apparel. Get 30% Off The North Face ThermoBall Full-Zip Insulated Jacket – Men’s. Valid on item #TNF00V3. Get up to 50% Off Prana Sale. 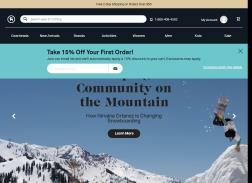 Get 20% off Select full price Climb Item. Get CamelBak Kudu 18L Backpack for $112.47, Reg. $224.95. Get up to 70% Off Columbia – Save Now on Summer Styles. Get up to 50% off Basin and Range winter collection classic styles. Get up to 80% off Select New Prana clothing and accessories. Get up to 60% Off women’s clothing, outerwear & accessories on sale from The North Face, Patagonia, Marmot, Columbia, and more top brands. Get Up to 65% Off Footwear. Get 15% Off your first purchase when you sign up for email. For first-time customers. Limited Time Only. Limit one use per customer. Shop The North Face, Patagonia & More on Sale Starting at $10.